Duquesne University President Ken Gormley announced today that he has selected Dr. David Dausey to serve as the new provost and vice president for academic affairs at Duquesne. Dausey, the provost and executive vice president at Mercyhurst University, succeeds Dr. Timothy Austin, who is retiring after serving in the position since 2013. A seasoned administrator, Dausey joined Mercyhurst, a Catholic university, in 2011 as director of the Institute for Public Health. He became dean of the university’s School of Health Professions and Public Health in 2013 before taking on the provost’s role in 2015. Dausey played a leading role in creating innovative, collaborative academic programs at Mercyhurst. He is the founding director of the Mercyhurst Institute of Public Health and created the first formal collaboration between an American university and the largest provider of rehabilitation services in Latin America. He was also instrumental in securing funding for new Mercyhurst centers and institutes, including the F.W. Hirt Erie Insurance Risk Management program and the Cyber Center for the university’s Ridge College of Intelligence Studies and Applied Science. Prior to his work at Mercyhurst, Dausey was the senior director of health programs and initiatives at Carnegie Mellon University’s Heinz College and a distinguished professor of health policy and management at CMU. Dausey also worked at the RAND Corporation’s Global Health Division, engaging in groundbreaking research on public health systems and global health. Dausey’s appointment comes at an exciting time in Duquesne’s history, as the University continues to excel as a leader in higher education and through its research and scholarly initiatives. Dausey also led a variety of community efforts while at Mercyhurst, consistent with the emphasis on community engagement in Duquesne’s strategic plan. He served as chairman of the board of the Erie Innovation District, working with local industries, government and other organizations to incubate and accelerate businesses focused on data science and cybersecurity. He created the first academic health department in the Northeast by partnering Mercyhurst with the Erie County Department of Public Health. While dean of Mercyhurst’s School of Health Professions and Public Health, he directed a variety of research and educational programs focused on community health. Dausey is an international authority on health care and public health and a nationally recognized epidemiologist. He has worked closely with senior health officials in more than 20 countries and experts at international organizations including the United Nations, World Health Organization and the Rockefeller Foundation. 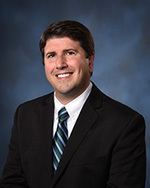 Dausey received a bachelor's degree in psychology from Mercyhurst University and his master's degree in epidemiology and public health from the Yale School of Public Health. He received his doctoral degree in epidemiology and public health from the Yale Graduate School of Arts and Sciences and completed post-graduate training in higher education management and leadership at Harvard University. Dausey will become Duquesne’s provost effective July 1, 2018.